That's right! You guessed it! 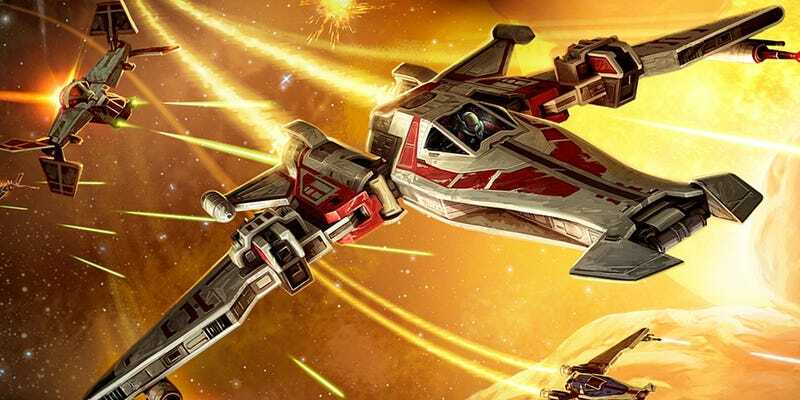 After almost two years of a head-hanging, frustrating, and disappointing rail-shooter for the space game of a STAR WARS MMO (the caps were for emphasis by the way), Bioware is finally releasing its newest expansion that is an actual, authentic space game where the player has full control of his fighter, ship customization options both stat-wise and cosmetic, and an added bonus of having that classic Star Wars feel as you're bound to hear a Wookiee scream in your ear or another "side-seat-driver" yelling at you for 'merely clipping' another enormous asteroid! This comes from a feature of your companions actually being gunners or copilots, their voice actors having recorded brand new dialogue just for this expansion. I will say initially I was a bit down upon first hearing Galactic Starfighter was strictly PvP. In case any of you who've read any of my other posts, I'm not all that keen on PvP. Confession: It is mostly because I'm pretty terrible at it, my reaction against other players being slow and not picking up on strategy or tactics as fast as my opponents seem to. (So, note to self: Stay away from any military position where I would be responsible for war strategies and combat tactics. It wouldn't be pretty)! Also, you've heard from me my distaste for the environment of PvP servers where there is virtually no sense of fair-play, no respect or sympathy from anyone-including your own faction, and how in open-world environments you're never safe to mind your own business during the leveling process. However, with the two opening battlezones of fighting, The Lost Shipyards and Kuat Mesas, the 12v12 instances are for PvP only, much like the warzones in ground combat, but I must say dogfights in space versus other players is a lot more enticing to me than the warzones have been. For one, I've always been fairly good at space/flight games, even against other people. Secondly, you have not only a choice of three different types of ships, but can customize them with mods and paint jobs to personalize them as your own-not quite JTL but I'll take it! Lastly, probably my favorite feature that pumps me up even for a space game that's initially only PvP, the ability to choose one of your companions or new crew members available (ooooh! That's exciting! Did I mention I was excited?) each with their own unique set of abilities you can use to leverage active abilities while the rest of your companions add passive bonuses! So why am I so excited about PvP for the first time? I think this picture sums it up best.